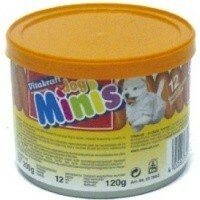 Vitakraft Dog Minis 120g is a pot of yummy, mini sausage shaped dog treats. These delicious treats have been enriched with all the essential vitamins and minerals your dog needs to stay in tip top condition. Vitakraft Dog Minis are great for use as a reward or just as a little extra special treat.